People are rallying to support Ahmed Mohamed -- not just on social media but also with their wallets. On Monday, 14-year-old Mohamed was arrested for taking a homemade clock to school that his teachers thought was a bomb. 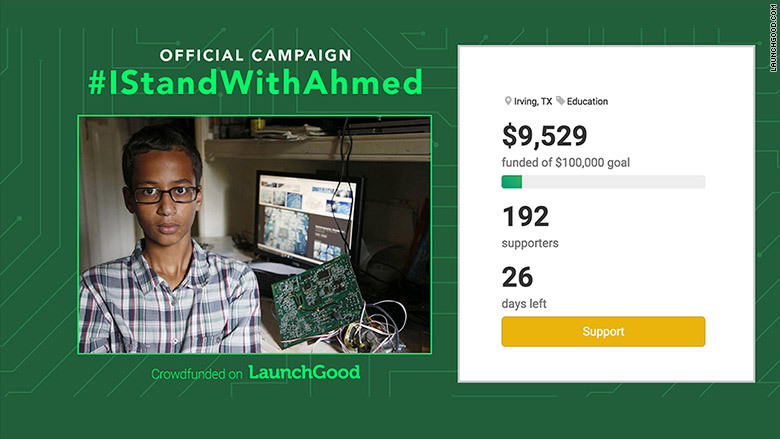 So crowdfunding platform LaunchGood started a campaign to raise $100,000 for the Muslim teen. In just one day, the site had raised over $10,000 from more than 200 backers. It's hoping to raise $100,000 by October 13. "It happened pretty quickly after news spread about Mohamed's arrest," said Blauvelt, who started LaunchGood in 2013. "I built the clock to impress my teacher, but when I showed it to her, she thought it was a threat to her. So, it was really sad that she took the wrong impression of it," Mohamed told journalists. His arrest triggered public outcry on social media and nationwide support for the teen, including from President Barack Obama and Facebook (FB) CEO Mark Zuckerberg. Blauvelt said his campaign has the approval of Mohamed's family. He said half of the money donated will go toward a scholarship fund for Mohamed and the rest to efforts that foster creativity and inventiveness in kids. In addition to LaunchGood, crowdfunding platform Gofundme has also launched a campaign for Mohamed. It's raised more than $4,000 with a goal of $60,000 that will go toward Mohamed's future college tuition.